So yes, Grimmjow is back! As he steps out of the entrance to the Garganta, he notes how long it’s been since he last saw Ichigo. He and Ichigo have a nice little back-and-forth banter for a few seconds about the state of each other’s scars before he pulls out his sword and claims that there’s no way he’s going to die without defeating Ichigo first. Just as it looks as if the two are going to have a huge climactic battle, they are interrupted by the arrival of another Espada from the Garganta. "Damn it woman! I'm trying to be cool and serious here!" 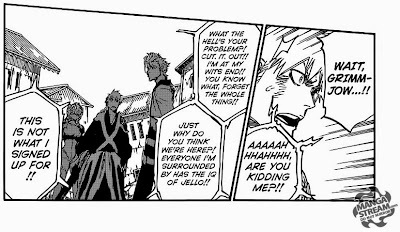 Yes, the dramatic moment is severely undercut by the appearance of Nel, who is now in her adult form and more than happy to see Ichigo again. Leaping right over Grimmjow’s head, she tackle-hugs Ichigo so hard that she pushes him a good few metres away, before clinging to him and explaining that Urahara gave her a special bracelet that allows her to change between her forms at will. 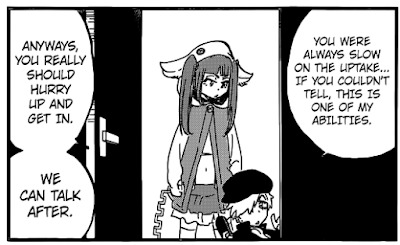 Orihime takes this a little less than well, and she has to be reassured by Chad that Urahara didn’t make Nel an adult just so that Orihime would be jealous. "No way! Never! Definitely not! Don't be silly! WHAT DOES SHE HAVE THAT I DON'T?" Getting up, Grimmjow complains that Nel is getting in the way, and demands that she leave so he can finish what he started. Nel retorts that he’s an idiot for wanting to start a fight when there’s already a war on, and brings up the issue of her technically outranking him. 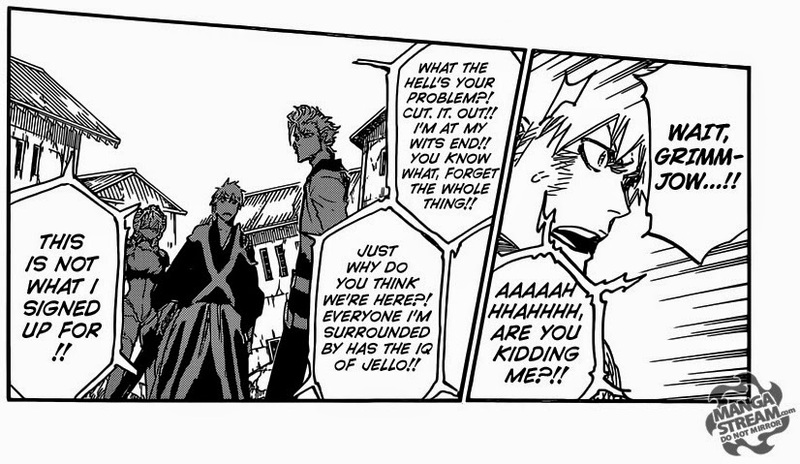 They’re immediately back to square one, with Grimmjow issuing a challenge to Nel. Before the fight can start, everyone is interrupted by a voice coming from inside the Garganta, telling them to get in before they’re seen by the Vandenreich. If numbers don't mean anything, then why do you want to be number 3? 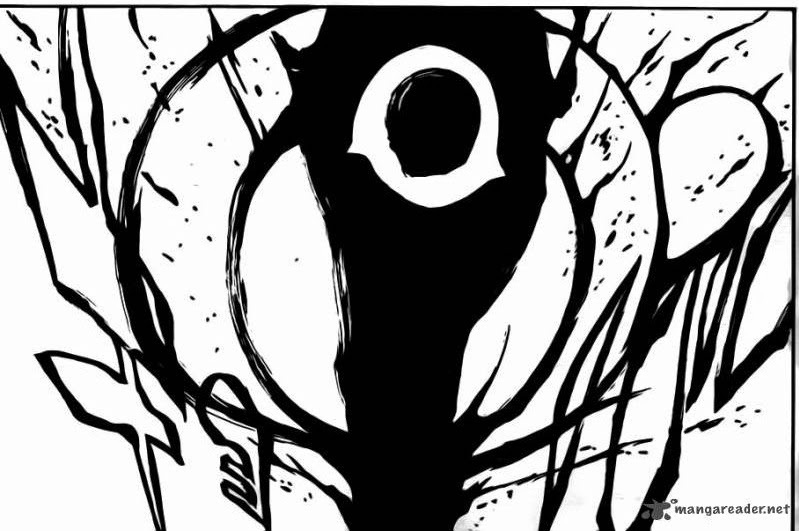 When Ichigo looks inside, he sees steps leading up to a large black box. As he wonders what’s going on, a door opens to reveal Riruka, who repeats her order for everyone to get inside. It turns out that Yukio is also with her, although his entrance isn’t nearly as dramatic. Once everyone is inside the box, Yoruichi offers to explain everything to Ichigo, although the explanation doesn’t get very far before Ichigo gets annoyed over the fact that he’s the only one locked out of the loop. She has a bunny hood! That is adorable. As it turns out, there are pockets of space surrounding the Dangai (the ‘tunnel’ between the Soul Society and the World of the Living) that are made up of lost souls, and the Garganta is actually the entire surrounding space. Inside each of these pockets of space, individually called a Valley of Screams, the reishi is a lot more stable than the surrounding area, and Urahara plans to use this to his advantage. Interesting fact: The 'Valley of Screams' first appeared in the first Bleach movie, Memories of Nobody. By bringing Riruka and Yukio to Hueco Mundo, he was able to use their abilities to create the box that everyone is standing in. Riruka used her power to take a small Valley of Screams and confine it in a box, and then Yukio shaped the box into a room that people could hide in. However, there is a large limitation in that the box can only go between the Spirit King’s Palace and wherever Yoruichi places a special nail. On the other hand, this also means that it’s the perfect way to launch a sneak attack on Yhwach. That must have been a fun meeting: "Want to risk your lives in another dimension?" Meanwhile, Yhwach’s elite guards discuss amongst themselves whether or not they should just be sitting around inside the palace. 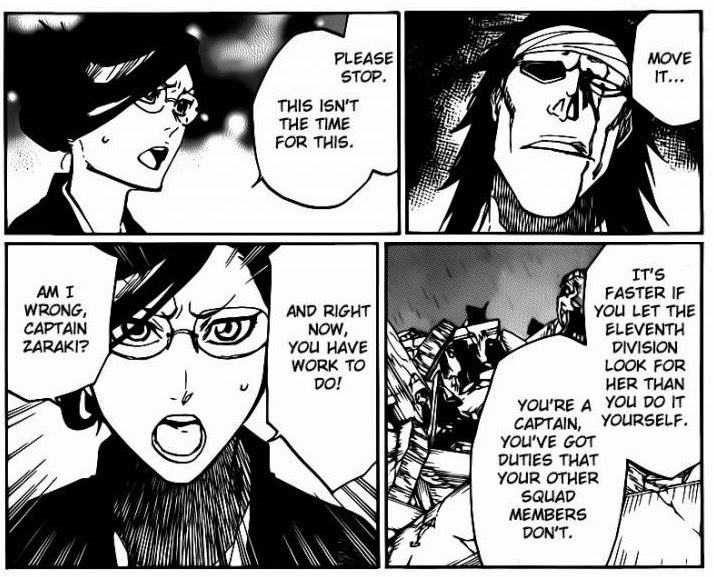 Askin points out that even if they were to go up and get closer to Yhwach, they’d just get absorbed by his power. Gerard notices that Uryu seems even more withdrawn than usual, and claims that there’s no need to worry, considering that Yhwach is on the way to becoming even stronger once he’s absorbed the Spirit King. Upstairs, the remains of the Spirit King’s cocoon fall to the floor and Yhwach, having achieved his goal, is covered entirely in darkness. Well that's not ominous at all. Well, it looks like I picked a very good chapter to start my reviews again. This was easily one of the best chapters we’ve seen for a while. However, since I’ve missed quite a few chapters, I might as well cover some of the more important moments from the past few months first. Good to see Riruka still hasn't lost her attitude. 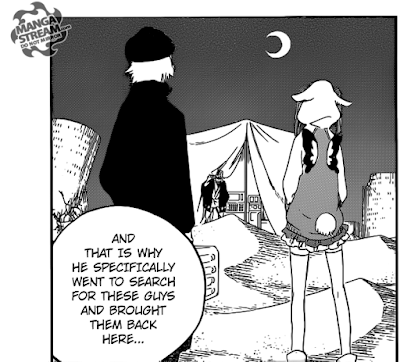 Firstly, it looks as though Yachiru is still missing. Given that the last time we saw her was just before the arrival of the four Femritters, I had assumed that they had something to do with her disappearance. But given the fact that Giselle showed up again without acting creepy as usual, it’s looking as though my theory may be incorrect. Yachiru’s disappearance did bring some good though – we got to see Nanao be a complete badass and stand up to Kenpachi, shout at him to his face, and not only survive, but cause him to change his mind! 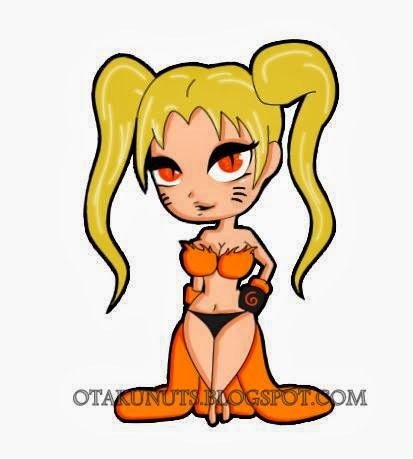 No wonder Shunsui likes her so much. 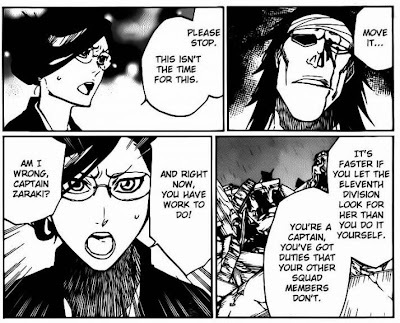 Nanao is taking no prisoners. Following on from that, Ichigo sliced the Spirit King in half himself. Nice job, hero. Due to the Quincy blood flowing in his veins, Ichigo was unable to stop himself from doing so, although it was unclear whether or not it was an automatic reaction, or if Yhwach can remotely control any Quincy blood. Either way, Ichigo was still able to throw off the control for a short amount of time, but by that point the universe had begun to collapse. Good going, Ichigo. "Wait - the TV! GOOD GOD, NO!!!" Fortunately, Ukitake was able to pull a backup plan out of absolutely nowhere. The abridged version is that since he was young, Ukitake has played host to a spirit/god/shadow-creature that has counteracted the effects of his illness and allowed him to survive. Apparently Mimihagi (the shadow-god-spirit) is the Spirit King’s right hand (although I’m not sure if that’s literal or not). Ukitake then releases Mimihagi, giving his body up in the process, and Mimihagi reaches up to the Spirit King’s Palace to hold the Spirit King together. If you’re lost at this point, don’t worry. This was one of the worst plot twists to come out of Bleach so far – it had zero foreshadowing, made very little sense, and was ultimately pointless in the long run. Whatever the hell that thing is, it's freaking me out. Thankfully, whilst Mimihagi was trying to glue the Spirit King back together, we got to see another, much more exciting plot point – the return of Aizen! It looks as though his time spent in prison hasn’t weakened him at all, as he’s still able to disintegrate someone’s body simply by getting too close to them. Unfortunately, we don’t get to see him out of the chair, although he doesn’t even need to get out of it to prove his strength now. The face of a man who has it all planned out. I’m unsure about what role Aizen is going to play in the final battle. 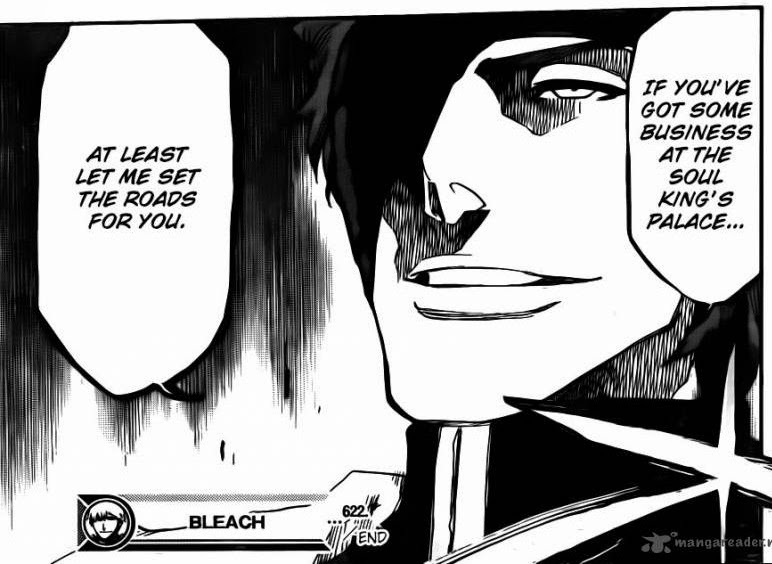 Given that he refused once before to join Yhwach, I very much doubt he’s going to take the side of the Quincies. However, neither can I see him just go back to jail after this is all over. 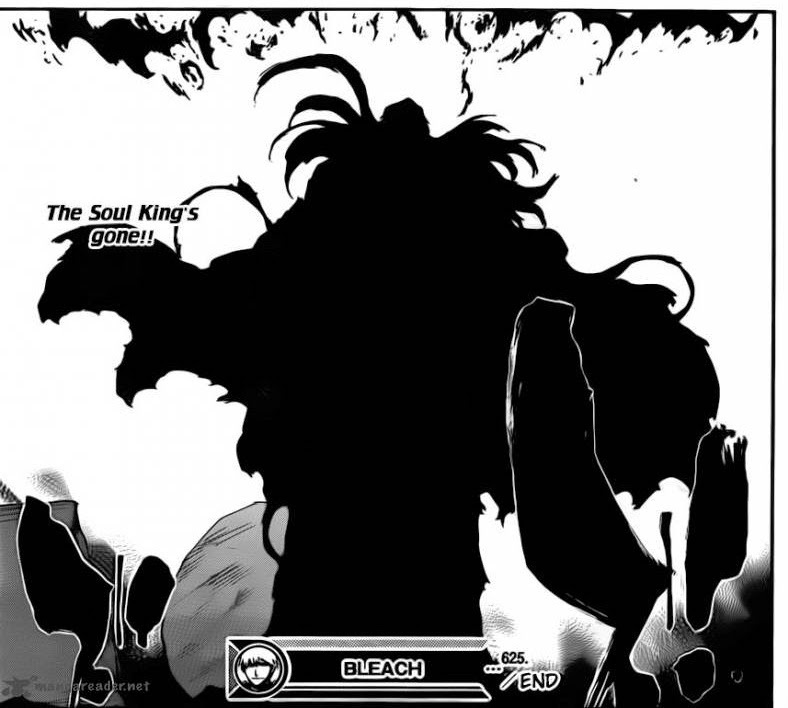 My current theory is that once Yhwach is defeated, Aizen will swoop in and retake his title as the main antagonist. How he’s going to do that when he’s strapped to a chair I don’t know, but I think he could pull it off. Half an hour later: "Are we there yet? Are we there yet? Are we there yet? Are we there yet?" In other news, three of the remaining Sternritter have decided to temporarily join forces with the Shinigami in order to reach the Spirit King’s Palace. Well, after they offed one of their own. What’s interesting to note is that Giselle and Bazz-B at least still seem to have full control over their powers, despite them being affected by the Auswählen. Granted, Giselle didn’t get hit by it, but Bazz-B and Liltotto did, and Liltotto even noticed that her powers were being stolen by Yhwach. I’m not sure, but maybe Yhwach simply drained their powers instead of completely taking them. "Oh, magical crystal ball, tell me your secrets!" 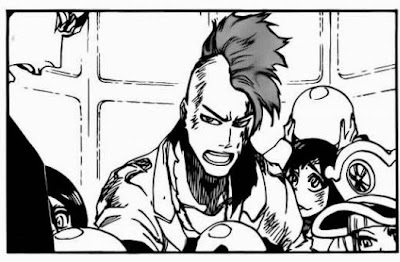 Of course, the best thing about the Sternritter/Shinigami team-up is that we’re one step closer to seeing Bazz-B meet Grimmjow. Since the two are so similar in terms of personality, it would be really good to see how they interact. However, there is still the issue of some Sternritter being unaccounted for, mainly Candice, Meninas and Bambietta. Whilst Bambietta is probably somewhere amongst Giselle’s zombies, we haven’t seen Candice or Meninas at all lately. I kind of hope they survive, as I do like the interactions between the Femritters. Finally, lots of characters have returned this chapter! Grimmjow has made his grand return, which is a moment we’ve been waiting years for, Nel is in her adult form again, and Riruka and Yukio have returned in a way that doesn’t feel unnecessary. I do have to wonder what happened to Jackie and Moe though, as they’re the only two Fullbringers that we haven’t seen since the start of this arc. On the other hand though, they were my two least favourites, so it doesn’t bother me that much. 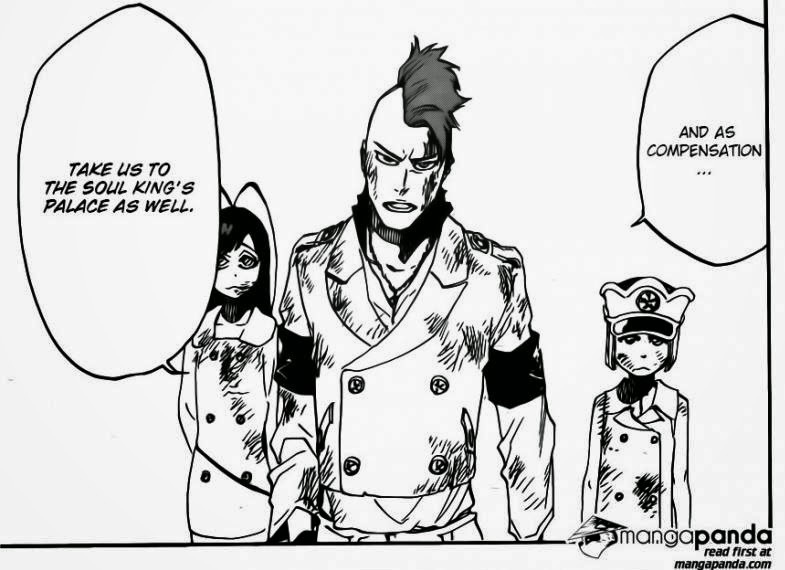 Hopefully now that Riruka and Yukio have been brought back we’ll see more of Ginjo, Tsukishima and Giriko, especially since they’ve been training with Ganju. I never realised quite how much I missed Riruka until this chapter. ClayDragon is currently studying Physics at university, and is constantly bewildered by it. The main method of contacting him is his Gmail account at kyleroulston1993@gmail.com. The alternative is his Skype account at kyleroulston1993, but he doesn’t use it that much. When not playing games or reading, he can be found with his head in his hands whilst trying in vain to understand quantum physics. Welcome back. Thank you! Trust me, I hope my exams went well too. I'm a bit upset that we probably won't see them fight, but I think I'll be satisfied if we get to see them interact and try and one-up each other. Great to have you and your reviews back! Believe me, my exams were brutal as well (geology) so I know how you feel. It was great to see so many old crew members back, and I'm glad they accounted for Nel. Great chapter overall. 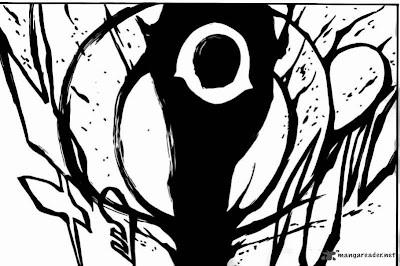 I would like to counter your point regarding Ukitake and the right hand; it was foreshadowed when A; ukitake went to the shrine and B: when Ukitake spoke to Kyrouarku when the head captain went to free Aizen (the hand was Ukitakes shadow). Redundant: yes, although it did help explain how Ukitake's survived being sick all the time. Loved Nanoa's scene, really helped her character. Although I hope we see her shikai in action, that would perfect it. Perhaps she teams up with Shuhei, Isane, and some of the others to gang up on a sternritter and show off their new abilities. I'd be willing to bet Grimmjow unlocked his second Resurrección, and someone is going to get painfully impaled. Or torn apart. Or impaled and torn apart. Thank you! I hope your exams went well! Ukitake and the Right Hand was foreshadowed in those two chapters, but compared to some of the other revelations that have happened in this arc, it didn't have enough of a set-up for me to be satisfied with it. It does answer some questions, but I think it's just raised more questions. I do want to see Nanao do more, I've always felt that she's a bit underused. I think she'll probably end up working with Lisa at some point, mainly because they were close when they were younger. 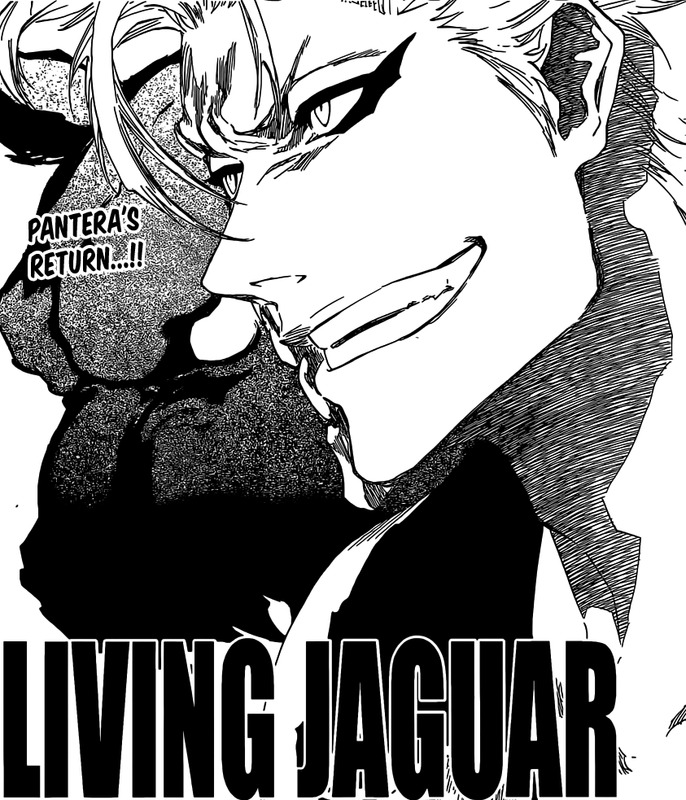 Yeah, I don't see Grimmjow coming back without having a Segunda Etapa. I'm interested in seeing how it looks, especially considering how awesome Ulquiorra's one was. You raise a good point about Harribel, we haven't seen her for ages, or Loly and Menoly. 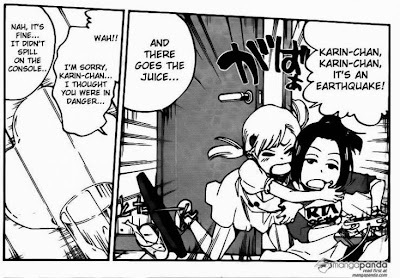 I had assumed that the Arrancar would have attempted to rescue her whilst the fight was going on, but unless that happened offscreen I don't see how Kubo's going to fit everything in. Ywach's shadow kind of looks like a mix between As Nodt's Vollstandig, and a lobster. I never saw the lobster claw-hand the first time I read the chapter. And now I can't unsee it. 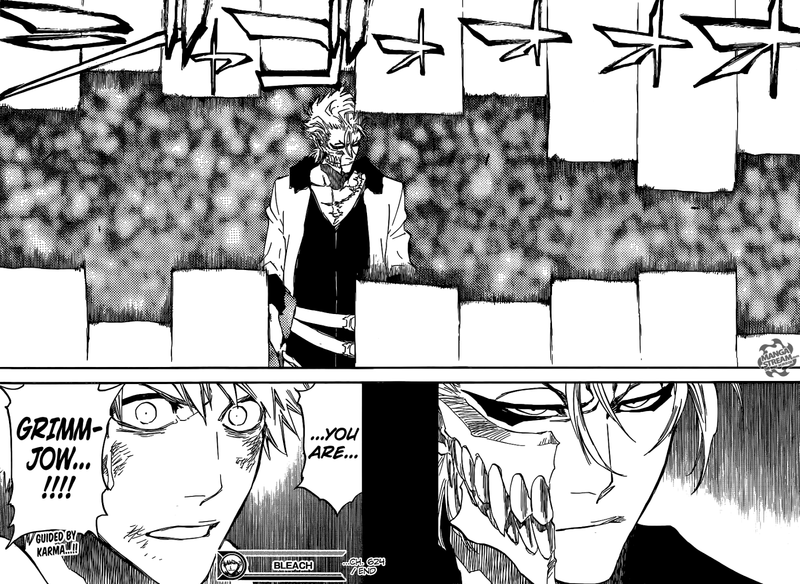 welcome back, there's sth that for me doesn´t make sense: yhwach said about he planned it all about ichigo's strenght and fate when aizen said that before... so what happen then? Thanks! My interpretation of that moment is just that Yhwach was saying it to confuse Ichigo and distract him. 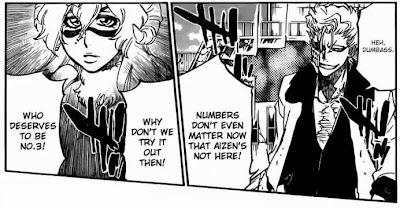 At least Aizen's planning made some amount of sense, but given that Yhwach wasn't involved in the story until the start of this arc, I think it's more likely that he was just saying that to mess with Ichigo.